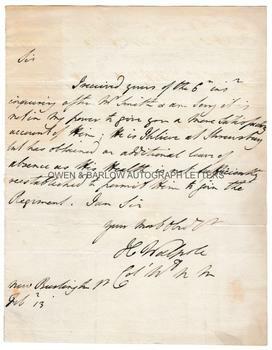 Horace Walpole autograph letter signed. English novelist, man of letters and art historian. Author of the gothic novel 'The Castle of Otranto'. ALS. 1p. New Burlington P[lace]. February 13th [no year]. To Col[onel] W. N. M.
"Sir, I received yours of the 6th inst. inquiring after Mr Smith and am sorry it is not in my power to give you a more satisfactory account of him. He is I believe at Shrewsbury but has obtained an additional leave of absence as his health is not sufficiently reestablished to permit him to join the Regiment. I am Sir your most ob[edien]t s[ervant], H. Walpole." 4to. Approx 9.5 x 7.5 inches (24 x 19 cms). Old folds. One short edge tear along fold line. Mounting traces to corners of verso. In very good condition. Horace Walpole was, arguably, the greatest correspondent of his time and his writings have shaped the history of the 18th century. The majority of his letters were avidly collected (almost immediately following his death) for publication in various collected editions of his correspondence and thence found their way into national and academic collections. 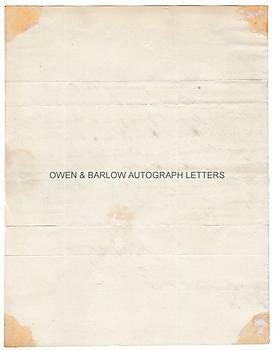 Consequently, any autograph letter of Horace Walpole is now a rarity on the market.